November is best time of year in Chiang Mai, when the rainy season ends and winter begins, with temperatures averaging 14 to 28 degrees Celsius. There’s warm sunshine during the day, and cool early mornings and evenings. It’s also the time of year when the magical Festival of Lights takes over the city. Some 700 years ago, Northern Thailand was known as the Lanna Kingdom. 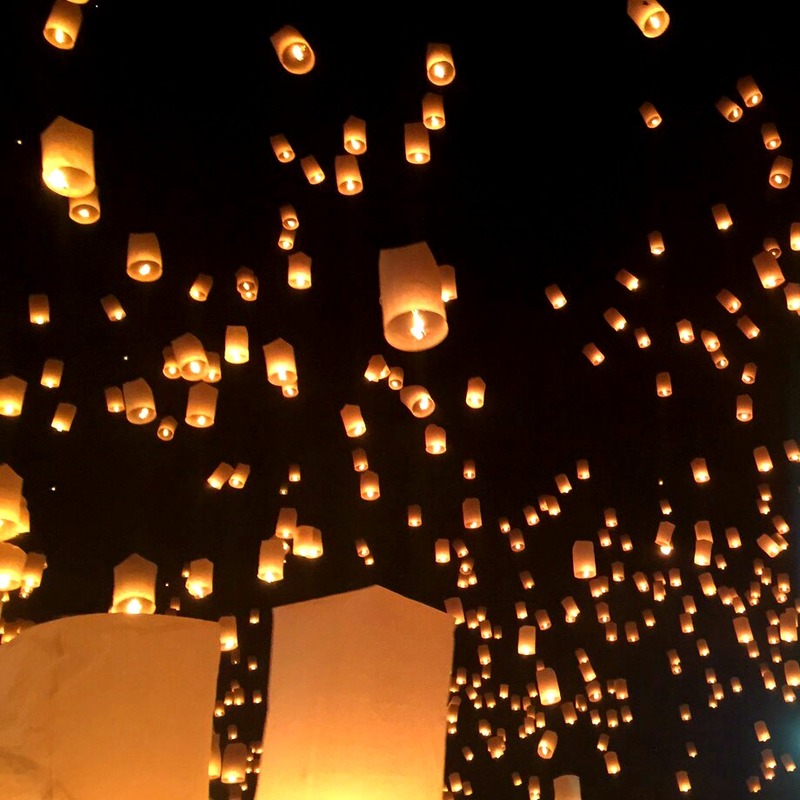 Chiang Mai was the capital, and where important ceremonies such as the Yee Peng Festival emerged, when villagers would prepare beautiful paper lanterns to decorate their houses. Yee = two, Peng = full moon. Yee Peng means the full moon night in month 2 of the Lanna lunar calendar (or November). The Yee Peng Festival (or Yi Peng) is celebrated on the full moon night of November, when locals go to temple to follow Buddhist traditions such as offering lanterns to the monks, listening to the monks pray, and meditating. 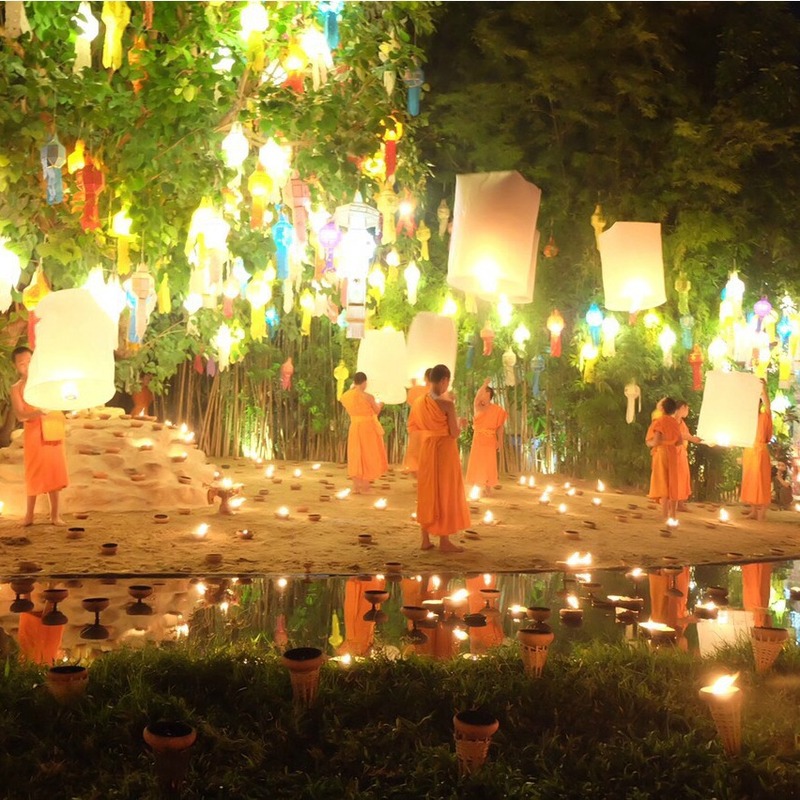 But the most known practice is the launch of khom loy, or lanterns, into the night sky. 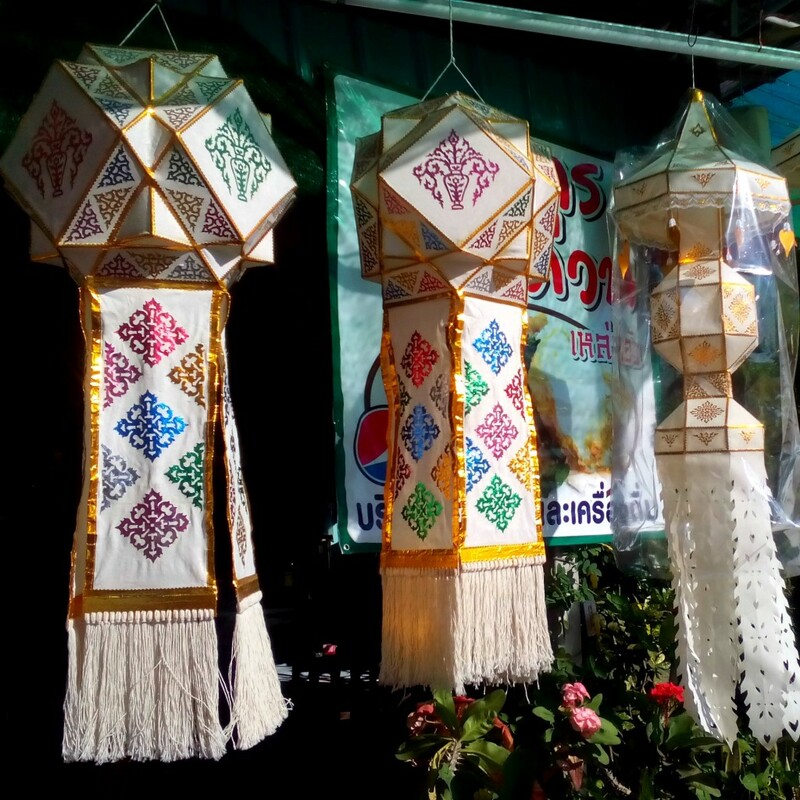 A traditional khom loy is made of a bamboo base and covered with mulberry papers. Before we light up the lantern, we give praise to Lord Buddha, who grants us wisdom in return — the flame of the lantern represents knowledge, guiding our lives on the right path. During this time, all across the country, locals also celebrate the Loy Krathong Festival, during which people offer their thanks to the Goddess of Water. Worshippers float krathong (a lotus-shaped vessel made of banana leaves and decorated with flowers, an incense stick, and candles) in the river, canals, and ponds, for good fortune. In exchange, it’s said the Goddess of Water grants a good life and good luck, and release from all bad things. In Chiang Mai, Loy Krathong is celebrated alongside Yee Peng, so you’ll see these magical lights both in the water and in the sky throughout the city. This year, the big day of the Yee Peng Festival will happen on November 25, with the biggest celebration at Thapae Gate, where there is a spectacular procession of krathong and the “Queens of Yee Peng” (contestants in the Noppamas Queen beauty contest — Noppamas was a chief royal consort from the Sukhothai Kingdom, and said to have made the first decorated krathong). 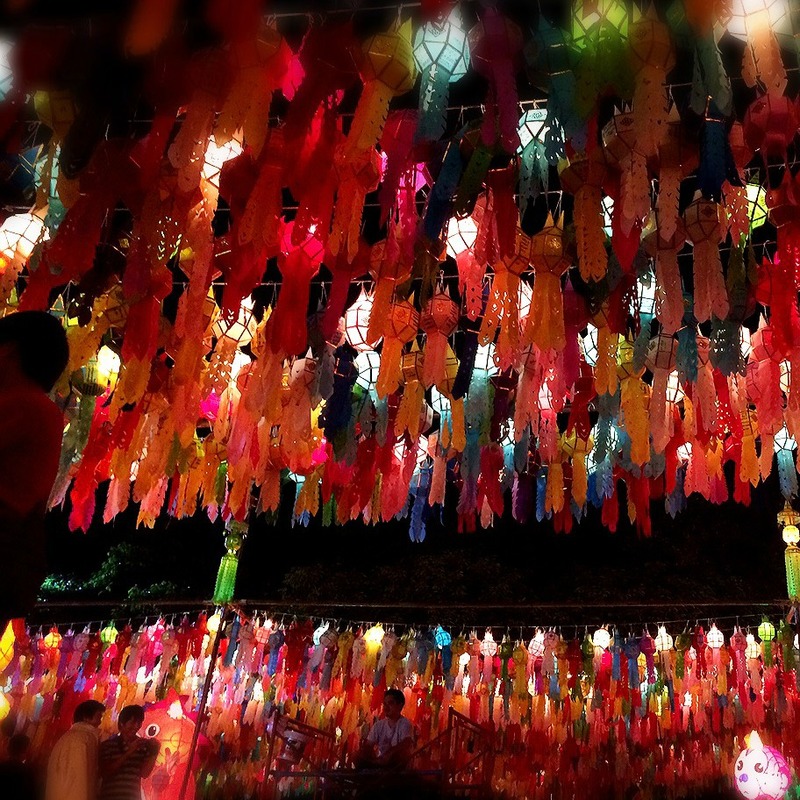 Both in the city and the surrounding villages, you’ll find tourists and locals alike joining the celebrations that last from early evening to midnight. If you want to launch a krathong, the best spot is near the Maeping River. You can buy a krathong or khom loy from any of the many corner shops that sell them on that night.